My poem, Fae of Forests, can be found in the summer solstice issue of Eternal Haunted Summer! Happy Litha everyone! My editorship officially starts today for the next issue of Eye to the Telescope! Theme is Witches! "A witch is defined as someone who is said to possess usually malignant supernatural powers. Since speculative fiction covers fantasy and science fiction as well as horror, we’re going to focus on ‘usually’ in that definition. I want any take on witches with any gender. Horrific witches, saintly witches, pretty witches, ugly witches, witches from different planets, witches from different dimensions, historical witches with a speculative spin. I want witches performing rituals, witches celebrating the sabbats, witches casting spells or curses. 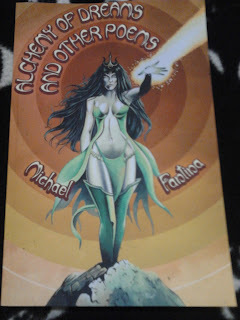 I know sorceresses, conjurers, enchantresses are similar but they are not the same. I prefer traditional formal and metrical verse done well. Prose poetry is fine. For free verse, enchant me with imagery and beautiful language. That doesn’t mean archaic language (though a little is fine). Think of Edgar Allan Poe, Clark Ashton Smith, George Sterling, David Park Barnitz, Charles Baudelaire." The Withering officially has reached its goal (my goal) of 50 poems! It has 4 sections; Nature, Supernatural, Psychological Horror, and Body/Gore Horror. It is currently halfway edited and the Afterword is finished. I am still contemplating putting endnotes with random facts about certain poems, but I'm trying to decide if I'm the only one who'll care lol. Diary of a Vampyress is shaping up nicely. It currently has 40 poems with 6 of those poems being translations! It currently has 8 sections with the 8th section having the translations. 5 poems are translated into Hungarian and the 6th is translated into French. All 6 poems have been published (5 are in DoaS and the 6th is in DoaV), so I'm debating pairing the English versions with them. I'm leaning with not pairing them. I really don't want reprints in DoaV. My goal is to have around 80 poems in DoaV (halfway there!) and filled with as many Gothic tropes as possible. Blog Entry on The Dark Poetry Couple. Manny Arenas has written a very sweet and insightful blog entry about Kyle and me here. It is very touching and it makes me happy knowing that I could help another poet. I am also mentioned in an earlier blog entry as well. The Black Aether: Online H. P. Lovecraft Magazine has posted four poems of mine and had them translated into Hungarian by Fanni Sütő! They are Horror, Lover's Witch, Daemonolatry, and A Queen in Hell. This is inspiring me to have a translations section in a future collection. Legtöbbjük zöld, kegyetlen és ronda. és minden árny erre terel téged. mert sok rém lapul roppant elménk rejtekén. egy kis tisztelet; s titkokat hoznak eléd. így hát eladtam a lelkem. fog villan ki dús ajkából. s szép aranyát tűz sikolynak. A bűzlő pokolba, mely fényed ellopta. Drága, szerelmem, engem itt hogy hagyhattál? Miért nem menthettelek meg? kérdem sírva. sírod mellett állok, de a lelkemben élsz. szívünk szakad pokolra szállt királynőnkért. 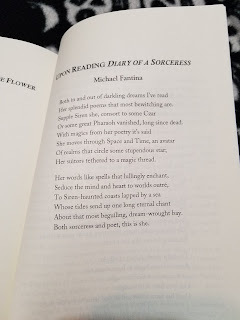 I am devastated to learn of the passing of poet extraordinaire, Michael Fantina. I never met Michael in person but we often emailed and exchanged many poems over the few years I've known him. When we first started emailing, we would discuss our favorite subjects to write about and he would send 4 or 5 poems at a time containing a certain theme or subject and I would try to match him with poems to send back but I couldn't keep up. He just seemed to have a neverending stream of poems to share and I could only send one or two back at a time as I'd write them or as my old ones were edited. I remember asking him one time if his new collection, Alchemy of Dreams and Other Poems, contained his poetry from his Rainfall Records and Books chapbooks (since I don't own those) and he said hardly any. I just thought that it was incredible he had so many poems and amazing ones at that. I remember asking him if he ever got writer's block and he told me when he gets writer's block, he writes sonnets. Sonnets broke through his block. He also said that he wrote poetry almost constantly (except when he was in the hospital for 2 months 12 years ago) since 1996. I wish my writer's block could be broken through by the power of sonnets. I wrote him to ask if he would honor me with a tribute poem for Diary of a Sorceress and was kind enough to oblige. 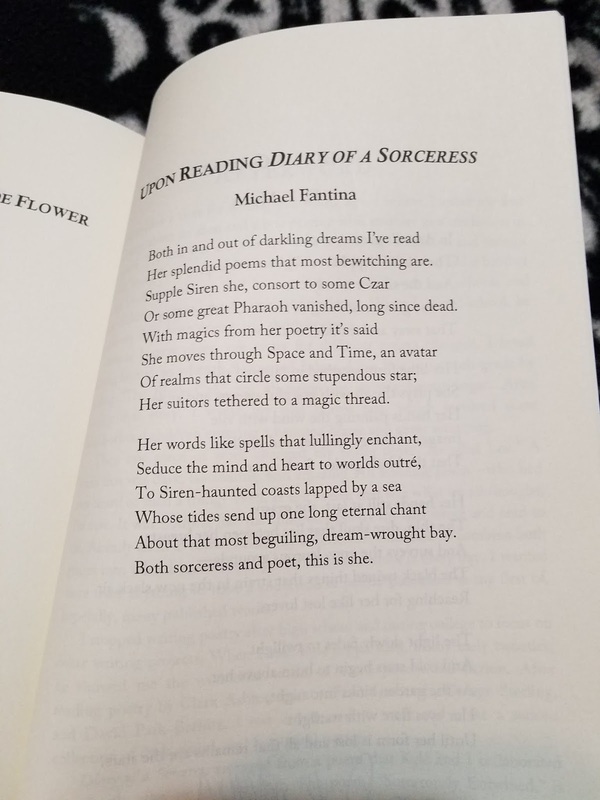 Michael's poetry is so rich and beautiful and if you have not read any of it, I urge you to pick up a copy of his collection, Alchemy of Dreams and Other Poems. It's currently eligible for the Elgin award and it made it to the preliminary round for the Stoker award this year if I recall correctly. Michael L. Fantina, born March 1, 1946, in Garrett, Indiana. Died on June 7, 2018 after a brief illness at Morristown Memorial Hospital. Mike lived most of his life in Bernardsville where he was a standout athlete at St. Elizabeth’s and Bernard’s High. He attended Bellarmine College in Kentucky and Rutgers University, where he received his BA. He was a Vietnam era veteran, serving at Fort Meade, MD. He worked in academia for most of his career, for a time at Florida International University and Seton Hall University and then at Rutgers, Labor Studies program. In retirement, he worked as the Lead Security Guard at G4S. Mike was known for his gentle nature and prolific writing. Through the years, he has had hundreds of poems and stories published, recently his book Alchemy of Dreams and Other Poems was published and next spring a book of his short stories will be released. An expert on the Civil War and World War II he was an active member of the American Legion. He was parishioner of Our Lady of Perpetual, and a strong support of many causes, Priests for Life, The Universal Living Rosary Association and other Catholic institutions. Mike had many hobbies and interests, anyone that knew him or was even a passing acquaintance probably received a wristwatch from him. He was an avid collector. Michael will be missed by his brothers, sisters, nephews. Her splendid poems that most bewitching are. Or some great Pharaoh vanished, long since dead. Her suitors tethered to a magic thread. About that most beguiling, dream-wrought bay. Both sorceress and poet, this is she. Rest in peace, Michael, you will be missed. I like organizing things and making lists. Doing so relaxes me and keeps me occupied. So on one bad day, I decided to put ALL my poems, that I still have, in chronological order. 46 out of the 282 will most likely never get published. The rest are either published or I plan to clean up enough to get published (if they're older).